How can an exciting Muay Thai help you with your loss weight plan? When it comes to losing weight, any physical activity is good. However, most people have problems when they need to go to the local gym or when they need to play the fitness DVDs they have at home. Some of them are too tired after a long day at work or after finishing all the household chores. There are also people who can’t find motivation to go to the local gym because the exercises practiced there are boring and the atmosphere is not very encouraging. If you are dealing with any of these problems and you want your loss weight plan to be successful, why not try a change in scenery? Use your next holiday to travel abroad and train there. 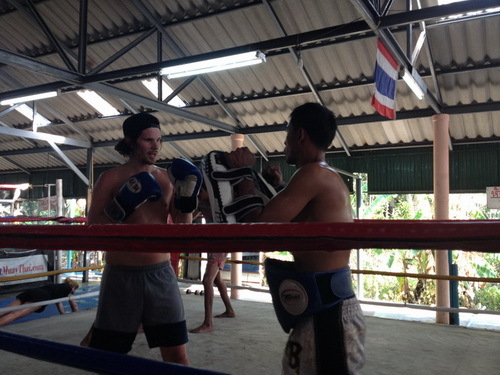 Visiting Thailand and Muay Thai training is a great suggestion. The best part is that it doesn’t matter when your next holiday is because the weather there is always pleasant and warm. For people who don’t know, Muay Thai is a very popular combat sports from Thailand. This is also the national sport of this Southeast Asian country. In the last decade many tourists have tried Muay Thai training classes just out of curiosity because they have watched many movies and series featuring Muay Thai fighters. They were amazed by the results. It turned out that Muay Thai training is a very powerful practice that can literally shred your extra fat and pounds from your belly and any other body part. One of the main reasons why Muay Thai training is so effective is the fact that the exercises are very intense. In addition, these exercises are versatile which makes the entire training process more fun and exciting. 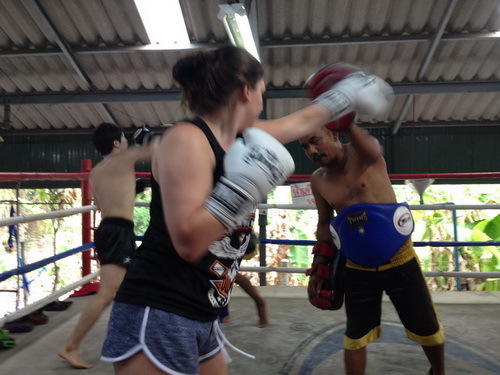 Muay Thai training is performed in a training camp where both men and women are accepted. Muay Thai provides long-term loss weight results and in addition, it helps women learn more about effective self-defense techniques. People of all ages and genders can expect improvement in their physical and mental health because as we have already said, every muscle and joint in the body is activated throughout the training process. Most people are well aware of the fact that the world we live in isn’t exactly the safest place. Of course, we have made dramatic progress as compared to the situation of not that long ago, and today we are comparatively safer. We have the police and the army taking care of our safety, and we can go about our day to day lives without worrying a lot about our safety. But of course, neither the police nor the army offers foolproof protection from harm. After all, a bad person may jump us when we turn on a corner, and they may attack as. What do you to in such a situation? Well, if you’re a regular person, then chances are that you will flip out and freeze, or run away. Or start waving your arms menacingly hoping that your foe will get scared. This is not your best course of action, of course. What you will want to do in such a scenario is to have a few self-defense technique at the ready in order to be able to protect yourself. So, you can learn these self-defense methods through the martial arts. And we sincerely recommend you to find a Muay Thai training camp as soon as you can, in order to improve your fighting skill and fitness level as well. If you go and train Muay Thai, a few things will begin to happen. First, as mentioned, you will improve your fitness, no matter who you are or where your starting point is. Second, you will learn how to defend yourself in a dire situation when you’re attacked. Of course, even the best martial artist in the world can lose a fighting duel to the world’s most unfit person at times – fights are known to be extremely volatile and unpredictable. So, no matter who you are, your best course of action is always to avoid any fighting whatsoever. Fight only if you have to – and only if you know how to do it and have confidence in your skills. 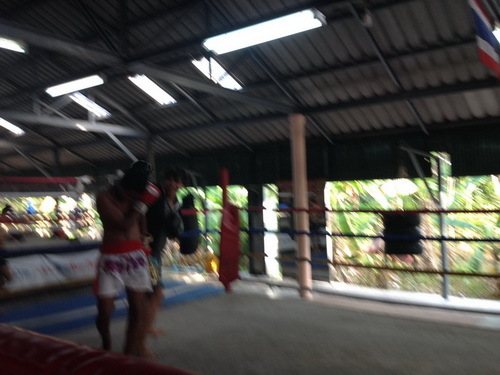 Muay Thai can give this to you – so we recommend you to start training Muay Thai immediately. Fighting Muay Thai as a woman is a sense of rewarding itself but it takes a hardship to maintain the repo within this male dominating sport. In this regard, there are few things worth accepting from advance if you are going to join any unisex Muay Thai training camp very soon. If you want to up your Muay skills through best masters, it is very likely that you have to wrap up and warm up with boys. Situations may show up where you have to actually convince your male opponent to hit you without having any gender biasing inside. Throw bombs, lob kicks at your opponent face and accept the same from him with a sporting spirit. To make those swift quick moves, it is primary to loose weight of the body. A lean figure gets more cutting advantage in Muay Thai over muscular ones. Therefore, get ready to go through an extensive fitness diet plan and to do some more cardio. Some fighters are even so professional that they cut the last minute water through Sauna. It is good if you have decided to make your training more impactful by fighting with men during learning phase but the inside ring situation will be completely different. You will see the more aggressive version of you in a faceoff fight. Public just go insane for women fight and that’s where you have to maintain inner balance without losing temperament while throwing your moves. It is no doubt that you will learn more attention as a women Muay fighter provided you will continue to amaze others with your skills, even the children. It can be best fostered if you will carry a social obligatory inside of your heart to become an ideal example and a source of inspiration for other women in future. Should you learn Muay Thai during holiday? When someone visits Thailand, the very first question that comes in his or her mind is, should I learn Muay Thai during my holidays in Thailand? This is an obvious question that everyone who is going to Thailand for more than 10 days will ask herself or himself. The reason is the popularity of Muay Thai. Yes, Muay Thai is popular all over the world. People know that it is the national sport of Thailand. They also know that it is a part of fight sport in Olympics. They also know that it is a great resource to loss weight and attain the desired fitness. Well, it has so many qualities but still people ask a question about learning it. This is because learning this art is not an easy job. It demands time and practise but if you want to use it for weight loss and fitness achievement then you must learn this. To loss weight and get the best fitness, you need only half an hour to one hour a day under supervision of an expert for starting few days and thereafter, you can follow the instructions provided by the trainer. It means when you are in Thailand for holidays, you may want to join a training camp where you can get basic training and instructions about Muay Thai so that when you go back home, you can practise it yourself. The best part of considering learning this art in Thailand is it gives you lots of opportunities and ease of finding a training camp. Thailand is the house of Muay Thai and here you will find 100s of training camps to learn Muay Thai. Even some of the camps do not ask you to pay anything and they will support you by providing basic training and providing tips to loss weight and get fitness that you would have ever wanted to gain. So do not waste your holidays just by exploring the beauty of Thailand. Spare an hour every day to learn this art so that you can bring back some great memories.